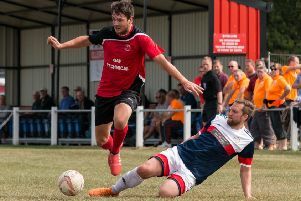 The excellent start made by Sherwood Colliery to their new season in the Premier Division of the East Midlands Counties League was brought to a halt by Shepshed visitors Ingles. After racing to seven straight victories, Sherwood were held to a 1-1 draw at home to Ingles, who sit just above halfway in the table. In front of a crowd of 43, Jordan Harris gave them the lead in the 53rd minute, but the hosts were pegged back by a goal from Jack William Green six minutes from the end. Sherwood are now third in the standings, level on points with second-placed Newark Flowserve, but two points behind leaders Selston, who have a 100 per cent record after eight games. This Saturday, they are at home to Nottinghamshire rivals Arnold Town, who are bottom of the table with only one point from nine games.